Microsoft has integrated Internet Explorer 10 Platform Preview 3 with the recently released version of Windows 8. If you look close, you will find two different versions or styles of Internet Explorer in the operating system. First the standard desktop browser and then the Metro UI browser. According to Microsoft, they both use the same core, are one program with two different skins. There are fundamental differences though. The Metro UI version of Internet Explorer is plugin free, which means that you won't be able to access Flash, Silverlight or Java contents using that browser. Microsoft concentrates fully on HTML5, which is a bold move. The desktop Internet Explorer 10 on the other hand will continue to support browser plugins and other standards and other browser extensions. Microsoft notes that "the Metro style browser in the current Windows Developer Preview is for developers, not consumers" which means that it is likely that it will get optimized and fine tuned before the RTM version of the operating system is released. The two "experiences" share data between each other. This includes the browsing history, typed addresses, favorites and settings among other things. 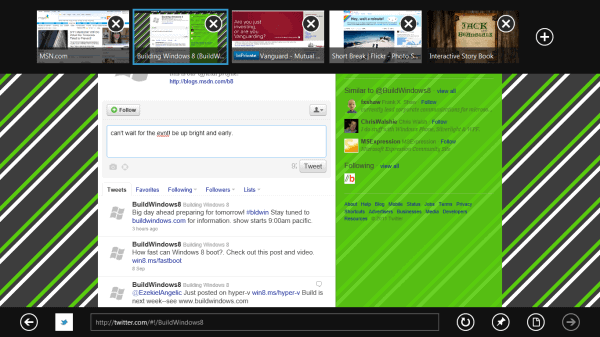 Here is how Internet Explorer 10 looks under the Metro UI. The user interface has been reduced to a bare minimum. All you see is a bar at the bottom to enter a web address and perform other actions like reloading the page or opening a previously visited website. The remaining user interface elements auto hide once the user begins interacting with the website. The controls include an option to view the current page in the desktop browser, which can be handy to access websites that rely on plugins. Microsoft has created a short demonstration video which you can see below. Offering two versions of Internet Explorer on the same operating system feels redundant on first glance. I can see tablet users working with the Metro UI version of IE10 as it seems easy to use and work with, but even they will run into many websites that do not work properly because of missing plugin support. Think of all the Flash gaming sites for instance, they won't go away in the next year or so. And what about Windows users who would like to use the full version of Internet Explorer in the Metro UI? Is there a way to do that? It is impossible to answer all questions that we have at this point in time. Windows 8 is a work in progress. I do hope that Microsoft will offer ways to customize the operating system to please all users. You can read more about Internet Explorer 10 in its current form on the Building Windows 8 blog. Now you just need to make a post about how to close metro apps without having to ctrl+shift+del them to death! In order to close an app you drag your finger from the top of the screen to the center. when the app minimizes you drag it off to the left. easy! To close all you have to do is click the top of a metro program and drag it down. HTML 5 is 90% Java they have simply removed the EMBED Tag which is how you place content like silverlight or Flash. Java still works please be careful when making bold statements like this.